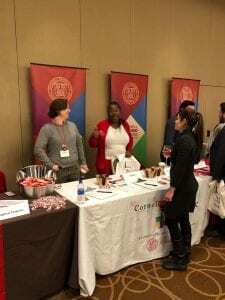 Walking into the Sheraton Boston Hotel lobby, I immediately saw a big Cornell banner and the friendly desk clerks were all wearing Cornell polo shirts. I headed to the CALC registration desk and picked up my name badge. 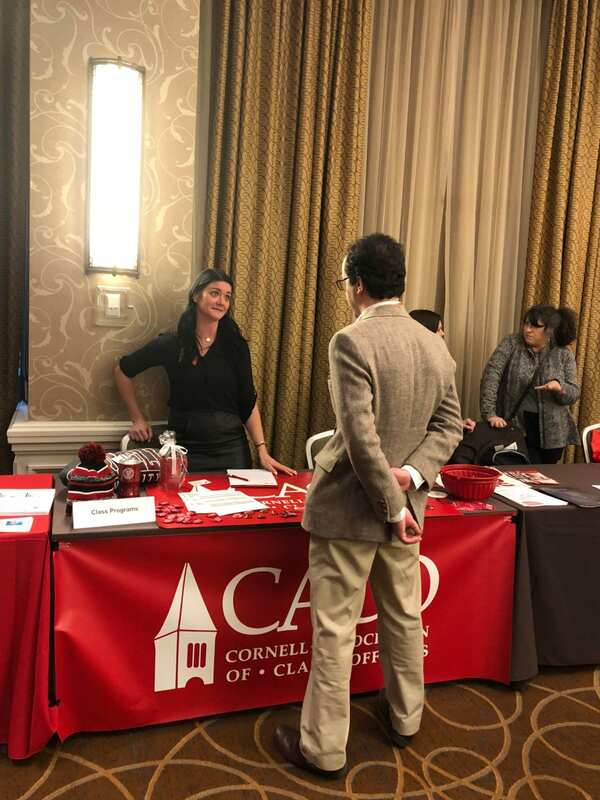 In the registration lobby, there was a huge counter filled with Cornell pens, CALC schedules, brochures, and affinity tags for the name badges, such as what state you live in, Greek affiliation, and your leadership role(s). There are also tables with snacks and coffee/tea stations, a step and repeat, a bank of computers to allow alums to vote for alumni trustees and a networking area. This is the hub of CALC. On Friday afternoon, the opening session was with Ryan Lombardi, Vice President, Student & Campus Life. The highlight was a student panel where six students discussed their life on the hill. Next, depending on your leadership role, you could attend your class meeting or various break out sessions. The evening concluded with a networking reception, a fraternity and sorority reception and for class officers, the Cornell Association of Class Officers Dinner. The students on the panel from earlier in the day were at the networking reception and were engrossed in discussions with alums. Saturday started early with breakfast in the Grand Ballroom. Associate Vice President of Alumni Affairs Michelle Vaeth ’98 and Cornell Alumni Advisory Board Chair Kelly Brown ’88, MBA ’92 presented the draft of the Alumni Affairs 5 Year Strategic Plan. We broke into small groups for discussion of the plan. It was a great opportunity to bond with other alums and we all left our sessions energized that Cornell was willing to hear our voices and happy we made new friends. Saturday afternoon included a lunch with Rakesh Khurana ’89, Dean of Harvard College, professor of sociology and organizational behavior at Harvard University, and Faculty Dean of Cabot House. He shared his personal journey managing change throughout his career and while implementing a strategic plan. The seating at lunch differs every year – this year was by your college. We had a choice of sessions in the afternoon, including Volunteer Core Competencies, Engaging Generations of Alumni Through Activity and Social Media, Greek Life Today, and Class Officers Make a Difference. No matter your volunteer interest, CALC has something for everyone. In our session, Engaging Generations of Alumni, we had a full room of club leaders and discussed best practices for social media and events. Who knew Curling was the most popular club event? Or that the Cornell Club of Rochester celebrates Founder’s Day on Ezra Cornell’s birthday and Slope Day on the same day as the undergrads. The day ended with a Volunteer Expo, Celebration reception, and Young Alumni Reception. Some class officers in reunion years stayed through Sunday to work on reunion planning. Other alumni stayed over until Sunday and enjoyed the great restaurants in Boston. So why attend CALC? With over 600 alumni and 150 students attending, it’s a great way to network, meet high-level Cornell University administrators, and learn more about all facets of Cornell that can help you in your leadership role. You will leave exhausted, rejuvenated, and well-prepared for your volunteer role. Have you hosted an athletics centered event before? Share your tips & tricks for success in the comments! On Sunday April 23rd more than 40 newly accepted students, alumni, and family members experienced life at Cornell Through the Ages from the perspectives of different alumni over time. Hosted jointly by the Coastal Connecticut Cornell Club (CCCC), the Cornell Club of Rhode Island, and Cornell Alumni Affairs & Development, the program was facilitated by Shana Mueller ’95 and featured three alumni panelists: Big Red Centenarian Sam Bender DVM ’41, Bob Linden ’71, MD ’75, and Bethany Douglas ’15. Sam recounted life on the Hill in the 1930s post-depression era, Bob described the tumultuous 1960s, and Bethany described the current campus culture. The event was kicked off by Caroline Wetzel ’99, President of CCCC. Caroline explained that Bob got to know Sam Bender after both Bob and Sam had signed up for the Cornell – Brown football game and lunch alumni event organized by CCCC. Bob was so moved by Sam’s vivid memories and humor that Bob was eager to organize a forum for Sam and other passionate alumni to share their experiences. Through a combination of answers to prepared questions, responses to queries from the audience, and spontaneous reflection, Sam, Bob, and Bethany explained why they chose Cornell, what experiences were most memorable, and what they thought differentiated Cornell from other education institutions. • Bethany describing all of the social networks on campus – and discovering in conversation with alumni in the audience that “Facetime in front of Willard Straight Hall” means something different today with social media than it did 50 years ago. Following the event, all enjoyed light refreshments and further conversations about life at Cornell. Indeed, the Big Red spirit was alive and buzzing in New England! Get to know your Regional Staff! Today we are featuring Lily Carbonara, Assistant Director for Alumni Affairs. She works out of the Northeast Corridor Office in NYC. CS: Tell us about yourself. LC: I grew up in Sullivan County, NY and attended Ithaca College’s Park School of Communications. I really enjoy cooking/baking, even if I’m not the greatest at it, because there are few situations food cannot make better (my dog Stella agrees). I am a Pittsburgh Steelers fan and will most likely read any Game of Thrones fan theory I come across; same goes for several other series/books as well – I’m a sucker for click bait. CS: What is your role at Cornell? LC: My role is to be the primary point of contact for the Regional Clubs throughout Metro NY, which includes Connecticut and New Jersey. I also work with the Cornell Tech Alumni Council and have been dabbling in the world of Cornell Women’s Network. I think of myself as the behind the scenes crew to the clubs’ productions; I’m here to make them look good and help them work through challenges. A piece of my job is also connecting alumni to opportunities and each other; it’s always nice to see how those simple introductions can blossom. CS: What do you like most about your position? LC: Meeting people and sharing creative ideas. Volunteers, and especially Cornellians, are always such interesting people with many passions and experiences. Getting to know these people really opens my eyes to many possibilities – on a personal level, and professionally in terms of ideas for new creative events or ways to work together. CS: What’s a piece of advice you often share with your volunteers? LC: Volunteering should be fun and offer you gratification. If it’s not, let’s talk so we can get your experience back on track and don’t feel guilty if you need to step away to take time for yourself or other priorities. CS: What are your favorite things to do in Ithaca? LC: When I was in college my friends and I would grab Wegman’s subs and have a picnic near one of the waterfalls – usually Buttermilk as it was easiest for us to get to. I also think that IC has the best view of the lake from campus! CS: Anything else we should know? LC: In my last job I was able to interact with my volunteer team in person on a near daily basis, and that is something I miss; real time conversation has a certain je ne sais quoi that emails can sometimes lack. 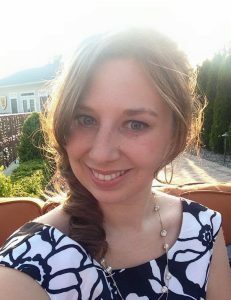 So, invite me to your events, call me to share updates or ask questions, set up video calls (one on one or as a group), or let me know when you’re in NYC so I can connect with you better – my metaphorical door is always open! While I work with and in Metro NY, I’d love to connect with volunteers and events from other regions and parts of the University as well should the opportunity arise. Lily can be reached at lc788@cornell.edu or (212) 351-7682. It’s that time of year again- admissions decisions have come in and students are deciding where to spend the next 4 years. Many of you are hosting Accepted Students receptions in the coming weeks. Here’s a re-post of an article from two years ago that includes some helpful tips on increasing student yield. For the most recent facts and news, visit Cornell admissions. Thanks for everything you do to show accepted students why they should go Big Red! In March, 2015, Susie Schneider and Kyle Downey from Cornell’s Undergraduate Admissions Office (UAO) spoke to Regional Club and CAAAN Leaders. They spoke about the importance of yield, defined as the number of entering students/number of admitted students. Cornell is home to students from all over the U.S. and 120 different nations – anyone can find their place on the hill. The depth and breadth of academic options are amazing. Great athletics and rich traditions enhance the Cornell experience. Cornell has 250,000 living alumni all over the world – it’s like joining a great Big Red family. What is your club doing to improve yield in your area? iModules training webinars- sign up now! Do you have access to iModules? Do you have questions about how to create emails or webpages? If so, read on! Ron Babuka will be leading several webinars in the coming weeks about the creation of emails and webpages in iModules. He will go through each process step-by-step and take questions. The only requirement for attendance is that you have administrative access to iModules. See more information and register! Cornell Giving Day- Thank you! Thank you for making Cornell’s 3rd Annual Giving Day the best one yet with $6,321,961.59 raised, 8,640 donors and 12,209 gifts! Which college, program area, or project did you contribute to on Giving Day and why? Following the local spirit of innovation, the Cornell Club of Austin is always trying new events to connect and engage with our expanding community. Last May, one of these experiments was Cornell Slope Day in Austin. The event was held downtown at Uncle Billy’s Brewery and Smokehouse, where we met up for casual dinner and drinks. Relaxing with other Cornellians on the patio while enjoying live music made us almost feel like we were back on the hill, except it was about thirty degrees warmer than the festivities that were simultaneously underway in Ithaca. Alumni attending spanned several decades, but all were able to bond over their Slope Day memories as we reminisced about our time on the hill, whether it was comparing which year had the worst weather, or which artist put on the best show. Following up on the success of last year’s event, the Cornell Club of Austin is planning to turn this into an annual event. Stay tuned for a similar event at a local brewery this May. 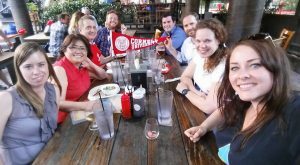 As one of the fastest growing cities in America, new Cornell alumni join us regularly for their first events and great friendships are made. As someone who knew no one before moving here, I can honestly say that my first friends in Austin were Cornellians. This community is really supportive, and provides great advice to those unfamiliar with central Texas, whether it be about affordable real estate, the vibrant New American food scene, or esoteric weekend festivals. Coming up soon, we are hosting a networking event to better share how to leverage the opportunities across our network for new Austinites. Our club is very active in Austin’s Ivy+ community, and plans many events with other alumni clubs in the area – follow us on Facebook or visit our website to find out about upcoming events and get involved with our community. CALC- what did you think? In the first weekend of February, 700 Cornell leaders from all over the world traveled to Baltimore for the Cornell Alumni Leadership Conference (CALC). It was great to see such a strong presence from our Regional Club Leaders! If you missed it, check out the Chronicle Feature to see the highlights from the weekend. If you attended, what was your biggest takeaway? If you did not attend, what would you have liked to learn? On Friday, February 3rd, a sea of red converged on Baltimore’s Inner Harbor. Members of the local Cornell Club of Maryland (CCMD) and visiting attendees of the Cornell Alumni Leadership Conference came together for a special event at the National Aquarium. 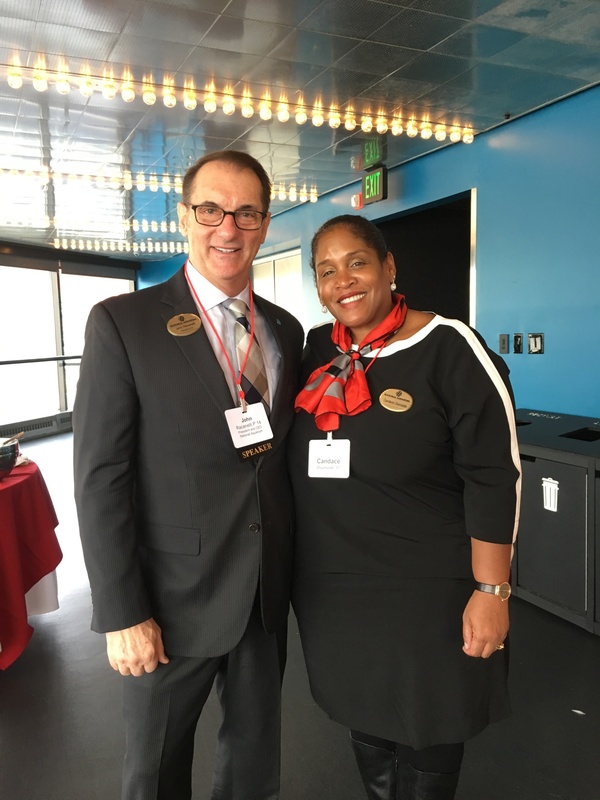 The engaging and educational day was a special collaboration between the Cornell Club of Maryland, the Northeast Corridor Office of Alumni Affairs, and the fantastic staff at the National Aquarium. The “Welcome to Baltimore” was a family-friendly outing for local Maryland alumni and the kickoff event for the CALC weekend. The morning began with delicious catering by the Harbor Market Kitchen and a warm welcome from Theresa Stegman ’07, Treasurer of the Cornell Club of Maryland. Theresa encouraged local alumni to stay active and consider leadership roles in the club and then introduced the keynote speaker. John C. Racanelli P’14, President and CEO of the National Aquarium, spoke about the evolution of the aquarium and the role that it plays in both regional and national aquatic education and conservation. After his remarks, Mr. Racanelli addressed questions from the audience and assured everyone that the aquarium would continue its important work in preserving aquatic ecosystems and advocating for the sciences. Following the morning session, alumni had the opportunity to network while they enjoyed the beautiful view of the inner harbor and tour the aquarium’s various exhibits. It was wonderful to see Cornell red all throughout the building as everyone enjoyed reconnecting with classmates, meeting new alumni and visiting the rays, puffins, dolphins and poisonous frogs. Mark and Anne Weadon ’72, first-time attendees at a CCMD event, enjoyed talking with classmates Stan Fish ’72 , DVM ’75, Deirdre Courtney-Batson ’72, MA ’75, and Nancy Roistacher ’72 (who were in town planning a CU class reunion). They also particularly liked the canopy exhibit featuring exotic birds and sloth! 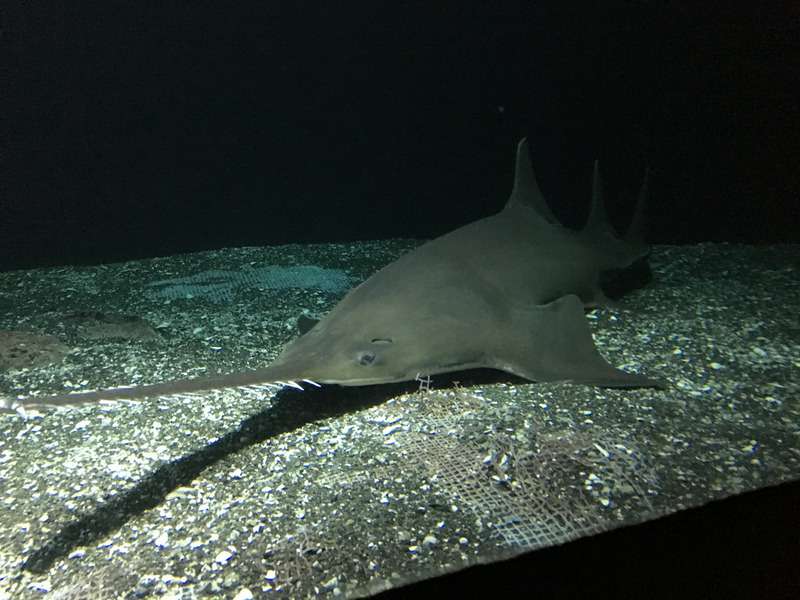 Molly Weadon ’98, CCMD Program Director, appreciated the CEO’s remarks about the upcoming plans for the Aquarium Waterfront Campus, as well as Stephanie Richmond’s ’11, MEng ’12 insights working as an engineer on National Aquarium projects. CCMD Director of Communications Jennifer Taylor ’99, MAT ’00 and William Anderson ’93 took the opportunity to brainstorm best practices for CAAAN while traveling the spiral walkway surrounded by sharks. 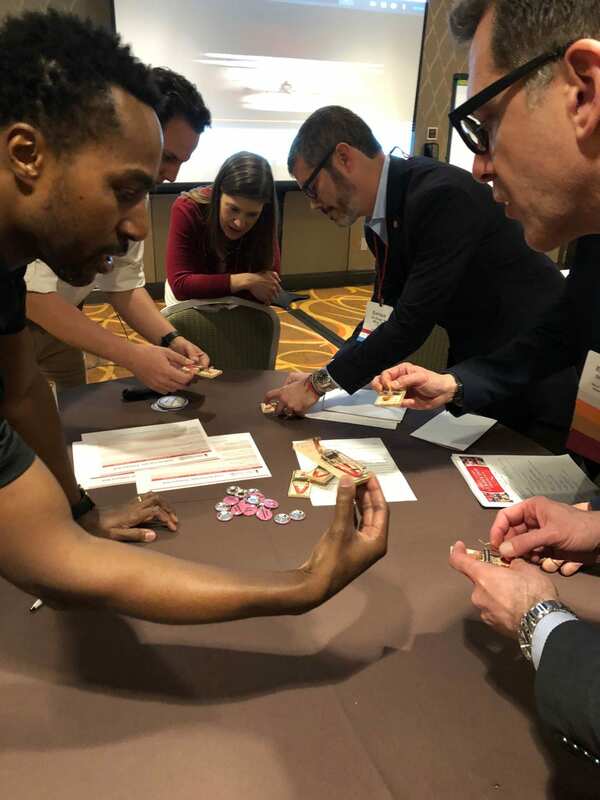 The Cornell Club of Maryland was honored to participate in the Cornell Alumni Leadership Conference and hopes that everyone enjoyed this special event.